A French term used to traditionally describe a sweet food made like a dessert similar to a custard or flan without a crust. 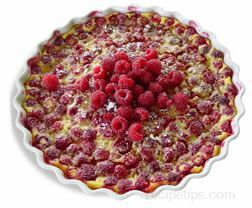 However, as recipes evolve, some foods are now being made as savory dishes, similar to a quiche and referred to as Clafoutis. 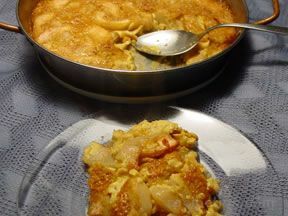 The savory version may include any of a group of ingredients such as cheese, eggs, meat, mushrooms, seafood, or olives and be made in a large baking pan or as individual appetizers. When made as a dessert, the French Clafouti was a country dessert originally made with black cherries. 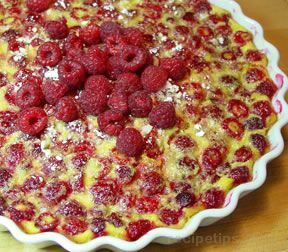 Consisting of a base of pitted and stemmed cherries, the Clafouti was prepared in a baking dish layered with a batter of sugar, flour, eggs, milk, and vanilla extract spread over the top and oven baked for 45 minutes or so. Served as either a hot or cold dessert, the Clafouti can be made with a crusty or pudding-like topping and may be made with fruits other than cherries, such as apples, peaches, plums, pears, or any berries. The Clafouti is then served with a batter topped with cream, fruit or fruit sauces.